The new DT85M Universal Input Data Logger Series 4 version has increased sampling speed, measurement range and programmable analog output. 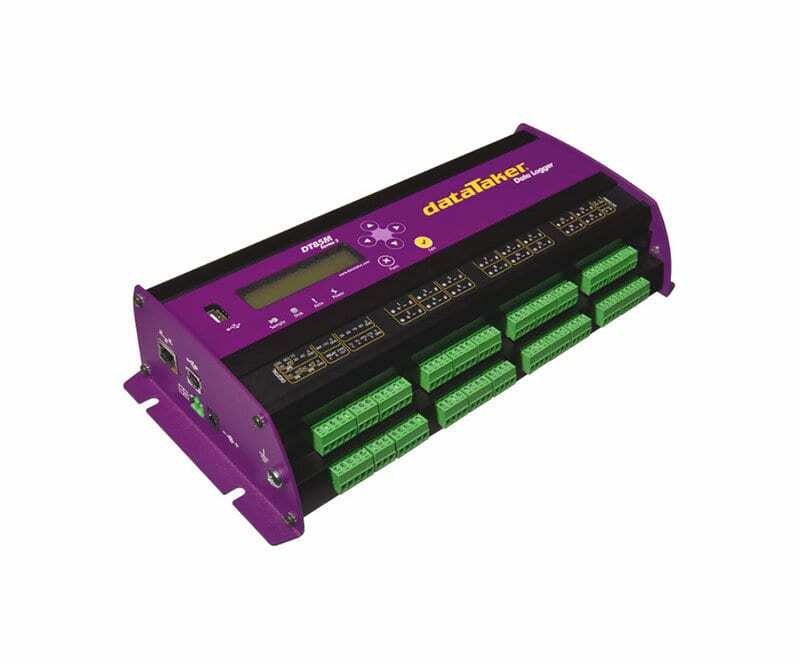 The dataTaker DT85M intelligent data logger is a fully featured low-powered logging platform with an integrated cellular modem, making it perfect for remote applications. The rugged design and wide operating temperature range of the DT85M provides reliable operation in virtually any environment. The DT85M’s perfect balance of performance with low-power also allows you to use a smaller solar panel without compromising on functionality. Connect an array of sensors through the versatile analog and digital channels, high-speed counter inputs, phase encoder inputs and programmable serial sensor channels. Temperature, voltage, current, 4-20mA loops, resistance, bridges, strain gauges, frequency, digital, serial and calculated measurements can all be scaled, logged and returned in engineering units or within statistical reporting. Set up sampling, logging, alarm and control tasks to suit your own requirements while interfaces for smart sensors, GPS and other intelligent devices expand the DT85M flexibility. Forget traveling long distances to get your data. Utilize the DT85M’s automatic data delivery features to schedule your data to be automatically emailed to your inbox every day, week, month or other time interval. More sophisticated systems can make use of the automatic data delivery features to send logged data to an FTP server. Alarm conditions can also trigger data delivery in addition to sending alarm messages to multiple email addresses or mobile phones. 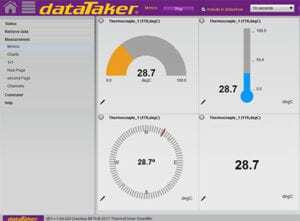 The DT85M is configured directly in your web browser using dataTaker’s dEX graphical interface. dEX takes you through the configuration of your logger, showing you wiring diagrams and allowing you to decide – in as much or as little detail – how you want to the system to work, suiting both novice or advanced users. Fundamental Input Ranges The fundamental inputs that the DT85M can measure are voltage, current, resistance and frequency. All other measurements are derived from these. General Combine values from analog, digital and serial sensors using expressions involving variables and functions. Actions Set Digital Outputs, Transmit Message, Execute any DataTaker Command. Modbus Server (master) Read/write data from modbus sensors and devices including PLC’s, dataTaker loggers, modbus displays etc. FTP Client Automatically upload logged data direct to an FTP server. Firmware Upgrade Via: RS232, Ethernet, USB or USB disk. dEX data logger software is an intuitive graphical interface that allows you to configure your data logger, view real-time data in mimics, trend charts or tables and retrieve your historical data for analysis. dEX comes pre-installed on every logger in the DT80 range. The software loads in your web browser so there is no need to install cumbersome applications on your computer. Being browser-based, dEX will work on all major operating systems including Windows, Mac and Linux. The configuration editor allows you to view, edit and save logger configurations in an easy-to-use Windows Explorer style user interface. The configuration tree view allows definition of measurement schedules and measurements. Wiring diagrams show available wiring configurations for each sensor type. Configuration can be stored and retrieved on either the logger or a local computer. Mimics are organized into panels which can be modified to highlight custom alarm conditions or data grouping. Mimics include dials, bar graphs, thermometers, etc. Real-time chart recorder mimic allows you to view trends and historical data over a custom time/date range. Up to 16 mimics can be displayed on up to 5 mimic pages. dEX is available as an Android App in the Google play store or and Apple app store.